MPC Renaissance is the much-anticipated merging of a premium MPC with a computer. 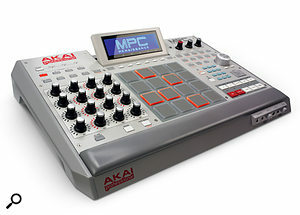 This new Akai Pro flagship combines software and hardware to deliver the experience of using a stand-alone MPC, while also allowing the flexibility of using a computer screen and keyboard that are seamlessly integrated. MPC Renaissance features 16 backlit genuine MPC pads, 16 Q-link controls, an adjustable backlit LCD screen, transport controls and a full array of inputs and outputs for easy connection in any studio. A two-port USB hub is built-in along with two 5-pin MIDI ins and four MIDI outs, Stereo ¼” out, Stereo assignable mix ¼” out, S/PDIF In & Out, Switchable Phono/Line in and dual balanced XLR combo inputs with phantom power. Designed in collaboration with dozens of working producers, the design goal for MPC Renaissance was to maintain the workflow and layout they love–to preserve the essence of the MPC. Now producers will be free to focus on making music, not learning to play a new instrument. Although the computer screen will display numerous advanced features, everything producers need to create tracks will be available on the smaller, backlit pop-up screen. MPC Renaissance changes the output characteristics of the sound to match that of the intended machine so users seeking that sound can easily get it. In addition, the analog output circuitry in MPC Renaissance is identical to the highly regarded MPC3000. MPC Note Repeat, classic transport controls and other traditional MPC functions allow music production directly from the MPC Renaissance hardware controller itself, without touching the computer. Users can connect a turntable directly to MPC Renaissance to record samples straight from vinyl and monitor the input using the built-in LEDs with clip indicator. Functions like piano roll editing, track editing, and audio editing, can all be done on the computer if desired. Because MPC Renaissance utilizes the RAM and hard drive space of the attached computer, it is only limited by what the user has installed. Thanks to its tight integration with software, MPC Renaissance can be used with high-end features of computer DAWs and plug-ins. DAW users who want to add real-time triggering of drums, loops, chops and samples using genuine MPC pads with their computer can do so easily. Users of earlier MPCs can easily migrate all of their previous work to MPC Renaissance. Programs and Samples from previous MPCs can be brought into new MPC Renaissance Programs via the MPC software. Even better, MPC Renaissance can handle up to 8 pad banks, which is more than any previous MPC including the MPC4000 and MPC5000. MPC Renaissance is expected to arrive at musical instrument and pro audio retailers in Q3-2012. Click here to discuss this story.